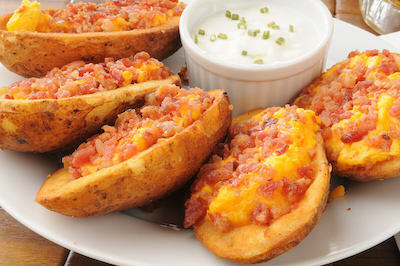 FRIED POTATO SKINS TOPPED WITH CRISPY BACON AND CHEDDAR JACK CHEESE. SERVED WITH SOUR CREAM. CREAMY MACARONI AND CHEESE BALLS DEEP FRIED UNTIL GOLDEN BROWN. SERVED WTH A SIDE OF MARINARA. GOLDEN FRIED CALAMARI RINGS TOSSED LIGHTLY IN GARLIC BUTTER WITH BLACK OLIVES, TOMATOES AND ZESTY SLICED BANANA PEPPER RINGS. SERVED WITH MARINARA. SHREDDED BUFFALO CHICKEN MIXED WITH CREAM CHEESE, RANCH DRESSING, MONTERREY JACK AND CHEDDAR CHEESE. SERVED WITH TORTILLA CHIPS, CELERY AND CARROT STICKS. ENJOY A 1/2 ORDER OF OUR CRUNCHY TORTILLA CHIPS TOPPED WITH DICED TOMATOES, BLACK OLIVES, JALAPENOS AND DICED ONION, TOPPED WITH MELTED CHEESE. SERVED WITH A SIDE OF FRESH CHILI, SOUR CREAM AND SALSA.